Office Timeline is an award-winning interactive timeline maker and project scheduler for professionals who need to build stunning visual project plans, schedules and Gantt charts. The software is especially useful for project managers, IT professionals, marketers, knowledge workers, and consultants requiring a simple but robust platform that can quickly design and create graphical project slides. And since it’s built for PowerPoint as an add-on, it provides a familiar environment to produce in a jiffy rich and stunning visuals for reports, updates, and business presentation. Office Timeline is equipped with intuitive design tools and powerful automation features to streamline project management as well as come up with impressive presentations. It also comes with several free timeline templates that feature different visual styles, colors and content which are customizable with Office Timeline Wizard so new users can smoothly learn to create timelines via step by step instructions. Aside from PowerPoint, Office Timeline also works with other applications such as Excel, Wrike, and Smartsheet for importing and exporting data pointers. The software is offered with a fully-workable free version and two premium editions for individuals and businesses. The paid plans unlock full features and functions, and dozens more of timeline templates that you can fine tune and tweak to suit your design requirements. Suffice to say that if you want to impress your audience with distinctively unique presentations and high-level reports that carry the “wow” factor, look no further than Office Timeline. Office Timeline works directly inside PowerPoint, so no other software is required. Because the timelines are native to MS PowerPoint, they are presentation ready and can be further customized using familiar PowerPoint features. Users are already familiar with PowerPoint and Office Timeline uses the same UI/UX as PowerPoint so there’s almost no learning curve. Office Timeline operates seamlessly as an add-on in Microsoft PowerPoint installed on Windows-based systems. It works with PowerPoint 2007, 2010, and 2013, giving you a most recognizable powerhouse presentation platform you’re accustomed with to design and create graphical project slides. Manually creating professional-looking timelines is a resource and time intensive task. And you’ll need a hefty budget if you have them created by commercial artists and graphic designers. With Office Timeline, you yourself can make professional timelines and Gantt charts quick and easy. It takes just three simple steps – choose the type of timeline you want to create, enter the data, and click Finish. You benefit from professional customized styles and templates that proven to be effective in the corporate world. No complications are attached with Office Timeline. It is a user-friendly tool built to work flawlessly with PowerPoint that allows you to create timelines and Gantt charts that are very customizable and as stunning and colorful. Key features such as Cope & Paste, and Import & Sync speeds up the development process of business timelines. You can copy and paste your data directly into the interface or import data via MS Project or MS Excel. Once the import is done you can synchronize data from your original Excel file via a sync function without reopening the file. You get access to dozens of free timeline and Gantt chart templates that you can instantly customize or, if you prefer, easily make your own right inside PowerPoint. The templates were made to be powerful and customizable, and you can edit template elements (dates, colors, shapes and the styles) automatically or manually with the timeline maker tool. There are templates for marketing plan, project plan, sales plan, office schedule, 12-month planning period, hourly or daily and weekly work schedule, project to-do list, project management process, milestones, legal and court timeline, and many more. Since its launch in 2012, Office Timeline has been used by over a million professionals in different industries around the world, proving its vast application in a variety of fields including finance, technology, health and medicine, and construction, among others. Where there is a need to plan, manage and present project flows, milestones and timelines, the software can do it in the most comprehensible and visually effective manner. All customer support is covered via comprehensive resource center that contains tutorials, how-to videos, and FAQs on installation, activation, updates and upgrades, and other technical issues. There’s also a self-service section in the vendor’s website for invoice and product key, license, and account matters. The vendor also offers phone, email and live chat support. 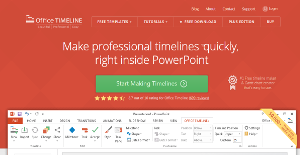 You can start off immediately with a free edition of Office Timeline where you can use built-in templates to generate attractive presentations, and later move to budget-friendly premium plans – for individuals and businesses – to utilize more powerful features especially for business presentations and academic reports. It is essential to realize that almost no app in the Project Management Software category will be an ideal solution able to match all the needs of all company types, sizes and industries. It may be a good idea to read a few Office Timeline reviews first as some software might excel just in a very narrow group of applications or be prepared with a really specific type of industry in mind. Others may work with an intention of being simple and intuitive and therefore lack advanced functionalities needed by more experienced users. You can also come across apps that focus on a large group of users and give you a rich feature toolbox, but this frequently comes at a more significant price of such a service. Ensure you're aware of your requirements so that you select a software that has exactly the elements you look for. How Much Does Office Timeline Cost? We realize that when you make a decision to buy Visual Project Management Software it’s important not only to see how experts evaluate it in their reviews, but also to find out if the real people and companies that buy it are actually satisfied with the product. That’s why we’ve created our behavior-based Customer Satisfaction Algorithm™ that gathers customer reviews, comments and Office Timeline reviews across a wide range of social media sites. The data is then presented in an easy to digest form showing how many people had positive and negative experience with Office Timeline. With that information at hand you should be equipped to make an informed buying decision that you won’t regret. What are Office Timeline pricing details? What integrations are available for Office Timeline? If you need more information about Office Timeline or you simply have a question let us know what you need and we’ll forward your request directly to the vendor.